Enough of us have finally taken notice to mention it. Talk about a crack in your local sidewalk – you ain’t got nothing compared to this. This has happened before. See the “repairs” made to the seams of the concrete slabs. 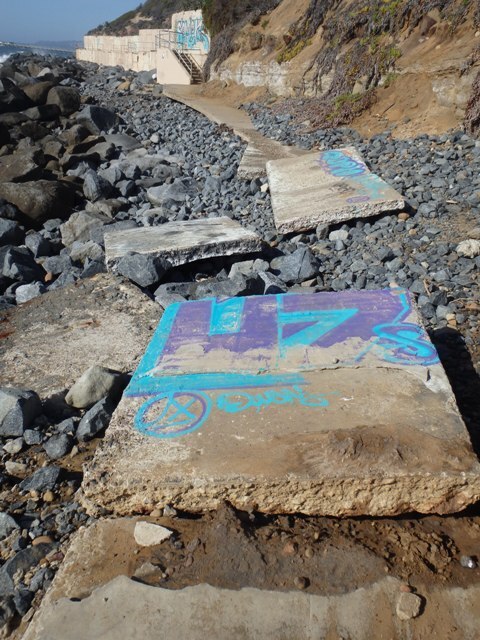 The concrete walkway at the bottom of Sunset Cliffs just north of Orchard Street has taken a beating from Mother Nature and the sidewalk is ‘a-buckling’. Sunset Cliffs from the foot of Orchard. The buckled section is just out of view along the concrete pathway leading from the stairs on the left. 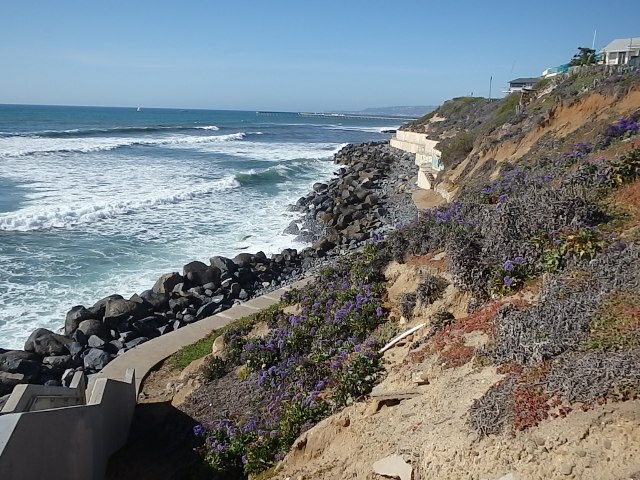 That is, it is predictable that attempts by government and private property owners along the famous and beautiful Sunset Cliffs to corral nature, prevent erosion and stop the gravitational, tidal and wind forces from doing their thing are bound to fail – eventually. Also, we the citizens of a City like ours with its dismal history of maintaining of public access-ways shouldn’t be too surprised when nature and the lack of City attention take their toll. This was brought to our attention by local lawyer, Robert Burns, who at one time was one of the main organizers of a group called the Committee to Save Sunset Cliffs. 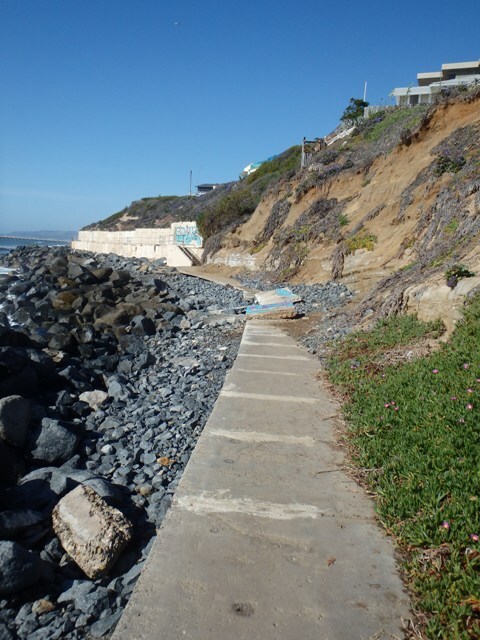 His recollection is that the coastal development permit and/or Local Coastal Program for the project that included this now buckled walkway called for a “raised beach” that was to be maintained for access and mitigation of beach loss due to being supplanted by the tons of boulders. Another beach – he recalls – the one at the foot of Cable Street – some locals call it Barron’s Beach – was to be preserved. Well, Burns says, Barron’s Beach disappeared within 1-2 years and the raised beach took a bit longer. Also the history’s maintenance has been dismal elsewhere too, especially at Crayfish Cove off the end of Santa Cruz Avenue. Burns also told us that there used to be some type of plastic lining between the “raised beach” and the boulders below that flapped about after the “raised beach” was destroyed. Sometime later the concrete pathway buckled severely as you see in those pictures. He is uncertain just when this all happened. It’s all part, we surmise, of our crumbling infrastructure – as the establishment and mainstream media are all a gaggle over whose to fund the next football stadium and where to put it. That section of the walkway has been like that for 15+ years.